A video overview of this climate change adaptation project in Chamwino, Tanzania. Women farmers indicate which techologies they can afford to take up. The choice is: "with your own money or resources", "with a loan", or "with a grant." 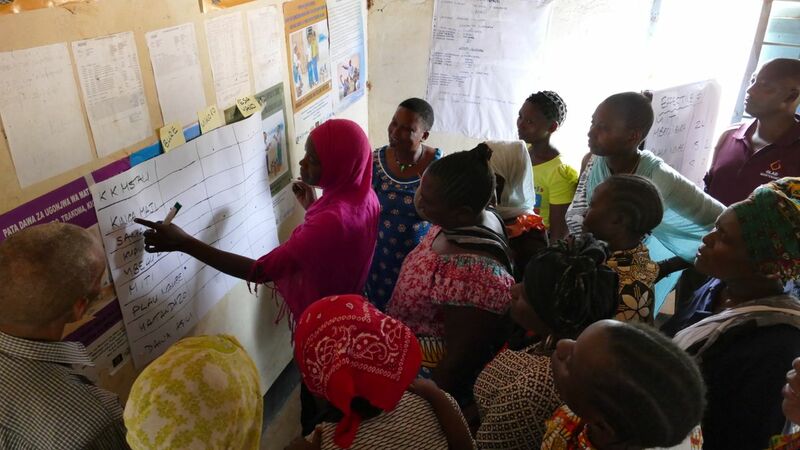 Tanzania Organic Agriculture Movement carried out a two day community technology assessment in December 2015 to explore the takeup, effectiveness, gender benefit, and affordability of the technologies introduced in the three Climate Change Agriculture and Poverty Alleviation (C3S) project villages in Chamwino District, Dodoma. The two workshops involved project beneficiaries from the three villages and control groups of non-project farmers. The assessment also compared project impact in terms of crop yields between project farmers and the control groups. Altogether 103 farmers participated in the workshops. Climate Change Agriculture & Poverty Alleviation (C3S) is a partnership project led by Tanzania Forestry Conservation Group and funded by the UK Department for International Development (DFID) within the Accountability Tanzania Programme. Recommendations based on the assessment are provided below alongside the main assessment results, findings and outcomes. The full report can be downloaded from the right-hand column. Improved seeds, ox tillage and Good Agriculture Practices are the package that needs to be rolled out across this semi arid region. Benefits accrue to both women and men. Famers’ access to improved seeds needs to be improved, e.g. by promotion of quality declared seed (QDS) production. Farmers should be supported with access to loan finance to buy (or hire) ox tillage equipment. All farmers should adopt these key project practices to gain significant yield improvements in normal years. ‘Average’ farmers (relatively low uptake of improved technologies) should adopt the practices of the progressive farmers (high uptake of improved technologies) to gain a significant increase in yields and a massive leap in climate resilience. Small livestock improvements should be included as a useful Climate Smart Small-Scale (C3S) agriculture technology. Farmers were first asked to name the technologies introduced by the project. A list of around ten technologies were named. Then farmers were asked to indicate their take up of the various technologies, disaggregating data by gender using different colour pens (red for males and blue for females). Take-up of the ten technologies introduced has been very high, with over 80% take-up of the top four techniques, over 70% of another two, and around 40-60% take-up of the more labour intensive actions. Most of the technologies introduced are affordable to most of the farmers, without need of loans or grants. However a few technologies are judged by farmers to be beyond their current means, requiring them to seek loans, particularly ox tillage implements, and to a lesser extent improved seeds – both of which are clearly recognised by farmers to be of high benefit. The group explored the yields of sorghum and sunflower over two years – a ‘normal’ rain year (2013/14) and a ‘drought year’(2014/15), comparing crop yields by project participants (Manchali A) and a control group (Manchali B). The workshop disaggregated ‘progressive’ farmers and ‘average’ farmers in both project participant and non project participant groups. In a normal rain year all project participants (both progressive and ‘average’) achieved higher yields ranging from 37.5% to 70% increase upon the control group. In a drought year only the progressive farmers (higher technology uptake) achieved higher yields ranging from 100% to 157% increase over the control group. In a drought year the ‘average’ (lower technology uptake) farmers achieved no better yields than the control group. In a drought year the progressive farmers (with high technology uptake) achieved much greater yields (5 to 6 times as much) than the ‘average’ (relatively low technology uptake) farmers within the project. All farmers adopting project practices gain significant yield improvements in normal years. ‘Average’ farmers (with relatively low uptake of improved technologies) who adopt the practices of the progressive farmers (with high uptake of improved technologies) will gain a significant increase in yields and a massive leap in climate resilience. Women particularly found improved seeds and ox-tillage beneficial, as they provided food for the family, and saved labour and time for other productive activities. Ox tillage was also found to facilitate planting in rows and easy weeding. Yield increased and climate resilience improved. It is clear that uptake of even one or two technologies brings a significant yield benefit in ‘normal’ local conditions, but is not sufficient to protect farmers against severe drought (as occurred in the 2014/15 growing season). However, we see that take up of several technologies provides further yield increases, but more significantly this provides major increases in climate resilience (measured by yield) during extreme drought conditions.